With an unlimited number of designs or even your own custom design you are bound to find something to fit in with your life with a guaranteed wow factor. Lets start with the construction, basically the sphere or globe shape is created by welding two half circle sections together, 6mm Steel is used to ensure even the finest details are still strong, able to withstand general use and of course the intense heat generated by your fireball. When the Sphere has been created it is then marked with the design and cut out using a plasma cutter. A Sphere Fire Pit can either be purchased in an oxidized state (the rusty steel look) or with specialist heat resistant paint, either option will create an amazing affect showing the outline of your chosen design when the sun drops and the flames start to glow. 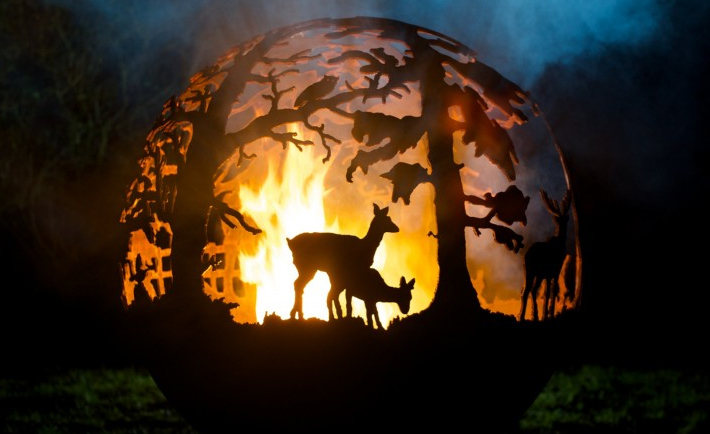 You will find a huge range Sphere Fire Pit designs including themed designs such as Halloween, Country themes and Animals. With this wide variety of pre-set designs you are sure to find the perfect Sphere Outdoor Fire to fit in with your Outdoor Space. There are many companies now offering standard designs that can be available for delivery straight away. Use the links below to view a selection that we found from trusted suppliers. Custom Made Fire Balls, these specially made to order pieces can take several weeks to design and cut so make sure you allow plenty of time especially if the Fire Globe is for a special event or a gift. The Chart below shows the rise in Google Search Interest for Sphere Fire Pits over the last 12 Months. What is Upcycled Garden Furniture?